"You know, I hated the word 'prodigy.' It made one feel abnormal. That's one of the reasons I wanted to start my school. I like to think of myself as normal. Perhaps I was wrong, perhaps I am a monster. All those musical children are normal children who should have a wholesome environment. I think children are vastly underrated. I think children are capable of much more than we expect of them in their early years." -- Yehudi Menuhin (1916-1999) from Conversations with Menuhin by David Dubal. "Prodigies" or not, I'm incredibly impressed. Earlier this month, some of the finest young violinists from all over the globe gathered in Cardiff, Wales, to play in the competition that Yehudi Menuhin himself created: The Yehudi Menuhin Young Violinists International Competition. The competition, founded in 1983 and held every two years, has become one of the world's leading competitions for violinists under the age of 22. Previous winners have become familiar name to us: Ilya Gringolts, Julia Fischer, Lara St. John, Tasmin Little, Nikolaj Znaider and Daishin Kashimoto. If you want to feel wonderful about the world, have a listen to Ray's playing: in the first round he played Bach, Mozart and Paganini; in the semifinals he played Brahms, Ravel, Seyfried and Ysaye; and if you want to hear more of the other participants, you can also listen to them. (Kudos to the Royal Welsh College of Music and Drama for getting these excellent-quality recordings up on the Web). What a lot of repertoire to learn, to perform all in the course of a week, under the highest of pressure. I wondered, how do they do it? And what was it like to be there, participating in this event? Laurie: Where are you originally from? Ray Chen: I'm originally from Taiwan; when I was a few months old, however, my parents and I immigrated to Brisbane, Australia, which is where I grew up. Laurie: How old were you when you started playing the violin? What made you start, and what made you keep with it? Ray Chen: I started playing the violin at the age of four. I'm not quite sure where I got the idea; however, I do know that it was my idea, as I picked up the toy guitar, put it under my chin and played it with a chopstick... the lessons then followed. I started with Suzuki Method, which was fun and made me want to play. Every Saturday there would be a "group lesson" where all of my teacher's students would gather and have a lot of fun. At the time, there were two things that were important to me about those group lessons: the part where I played in front of everybody, and the break where we would snack on cookies and cordial. Laurie: Who is your current violin teacher? Are you currently in school, and if so, where? Who have been your most influential teachers, and in what way? 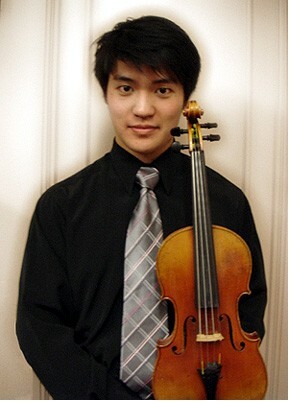 Ray Chen: My current violin teacher at the Curtis Institute of Music is Aaron Rosand. During the past two summers I studied with David Cerone at the Encore School for strings; unfortunately, (Encore is) not happening this summer, which has resulted in a change of scenery for me. I'll be studying at the Aspen Music Festival with Cho-Liang Lin and Paul Kantor. My teachers back in Australia have included the Hawkins Family. I studied with them for five years. They were very involved with Suzuki and emphasized the "having fun" part of playing music. It seems like a lot of players these days are forgetting this important aspect, especially as they get older and become more self-conscious. I also studied for seven years with Kerry Smith from the Queensland Conservatory, and in my last two years with her I also studied with Peter Zhang from the Sydney Conservatory. I'd have to say that every teacher gave me a different perspective to music and they have all been wonderful, supportive people in my life. Laurie: Have you played/placed in or won any other competitions? Ray Chen: I have entered many competitions - losing some and winning some. Luckily people only take note of the ones that you've won; however, I'll always remember the disappointing/hard times that I've been through, because only then do I truly appreciate the good times. The Menuhin Competition is probably the biggest competition that I've been in so far, but I'll be sure to do a few more! Laurie: What made you decide to enter the Menuhin competition? Ray Chen: I had previously entered the Menuhin Competition four years ago, in 2004, when it was held in London. I came third place in the Junior Section, so I thought that I had to do it again when the time was right. Laurie: What was unique about this competition? Ray Chen: This competition is unique in its Jury Panel, with Maxim Vengerov, Dong-Suk Kang, Pamela Frank, etc. ; and they look for the musicality and potential in each player. Laurie: How did you prepare for this competition? Is it any different from preparing for a regular performance? Did you do anything special to prepare? Ray Chen: Preparation is definitely the key. I prepared a year in advance and made sure I had performed all the pieces before I arrived at the competition. The difference between preparing for a competition in a regular peformance is probably the attitude - for a competition there's always more pressure to do well. Laurie: Did you play in the Menuhin Competition Orchestra, and how was Vengerov as a conductor? Ray Chen: I did not play in the Competition Orchestra. I did see the opening concert, however, and I think that it is unfortunate Vengerov is no longer playing. His presence on the stage combined with his wonderful musicality definitely captured every listener's heart. At 19 years of age he recorded his Bruch/Mendelssohn Violin Concerto CD... I realize that I may never be as famous as him (I'm 19 now as well), however, he's the person I look up to. Laurie: What was your favorite and most memorable part of the competition? Ray Chen: It would probably be my search in finding myself and my sound. The violin dealer Christophe Landon had a violin exhibition at the competition, and among those fine instruments was a very nice Stradivarius. I had never before played on one and immediately fell in love with the sound of the instrument. Every day, for the rest of the competition, I went to his exhibition to play on that Strad and tried to make my violin have the same sound. Having a good instrument is so important for a soloist. Mine never quite reached the tone, clarity, and power of that great fiddle, but nevertheless my ear learnt which sounds to pick out, and my tone improved. Laurie: Now that the competition is over: if you could play any piece you wanted to, at this point, just for fun and the love of the violin, what would you play? Why? Ray Chen: Hmm, this is a tough one. I really want to learn the Prokofiev Violin Concerto no. 1.. I think it's one of the coolest pieces out there. Laurie: What are your ambitions for the future? Has being in, and winning, this competition, influenced the way you are thinking about what you want to do in the future? Ray Chen: After winning this competition I definitely feel pressured to do even better. I've only just opened the door to a whole new world. However my dream is to become a soloist. However, it's a tough road to take, and you need a lot of people backing you up and giving you support. Family, friends, teachers, sponsors... and they're expecting you to not let them down. Laurie: Many congratulations to you, Ray! I just made a CD for my niece Madeline, my sister's first child, born just over a month ago. It's all lullabies and meditations. I've been meaning to record myself playing, for a long time. I'd wanted to get some show-offy piece all perfected, so I'd have a little something to put next to my name on all these crazy websites to show that I do indeed have chops. I still may do that. But these days, I'm inspired by other things. For all the mad technique we work to master over a lifetime – the spiccato, the sautille, the tenths, the runs in single and double stops, the trills and decorations – the music people want to hear is rather simple. The church hymn, played beautifully. The folk tune, the Christmas song, the song from the musical, the music that brings them back to their roots. My own beautiful children are now seven and ten, but when they were babies, I sang to them. I rocked them in my arms and sang to them. And it's interesting what comes to mind when you are singing to a baby. Pag Caprice 24 – didn't come to mind. I found myself making up words to traditional lullabies (it's really hard to find good English words), singing camp songs, singing songs from musicals (modified, imagine “Summertime” and “Maria” sung by someone who has to stretch to reach an octave...). I never did find a recording of lullabies that pleased me. A well-meaning, non-musician friend gave me a set of lullaby cassettes. I wanted to like it; she is such a good friend. But after just a few songs, I couldn't take that popsy-weird voice singing with a synthesizer. During this time, I wrote a prayer for my daughter, which I revised a few years later with the birth of my son. Putting it to music was always problematic; I did not trust myself as a composer, but eventually I came up with a very simple tune to match my six-note vocal range. I still sing it every night with my son. I know that pianists can do this, but he did it so well, in just the right style, without my having to explain a thing. It would have taken me weeks of torture to write a piano part, and then, well, it wouldn't have been the same. It would have been tortured. It seemed as easy as breathing for him; he just took it in and spun it out with the harmony. So Ben, thank you for, well, completing my prayer. Here I am, a visitor from Los Angeles, enjoying the peace and quiet of my sister's home, nestled in the rolling hills of Northern Kentucky, by Cincinnati. All week long, I've been taking credit for the beautiful spring weather: "I brought you some California sunshine!" I informed my five-month-old baby niece with a smile. This morning, as I was rolling over in bed, I awakened with a start. For some inexplicable reason, the windows were rattling softly, but insistently. Then, my bed shook, then the entire house shook! "You know," I said, as I held my sister's little girl later this morning, "Nobody can control Mother Nature!" You may have heard of Drew McManus, who runs a website called Adaptistration, a word he coined to describe an administration that is capable of adapting to our changing world. Specifically, McManus follows the triumphs and follies of symphony orchestras, with a good amount of advocacy as well. This week he is running a series called Take a Friend to the Orchestra, which features a different blog every day on the subject of introducing people to the orchestra. The bloggers include musicians, conductors, administrators, and...ME! My blog runs on Wednesday. I think this is a great idea, to think about our audience for classical and symphonic music. We have had a number of threads recently on the subject; let's see what some other people say about it. Many of you likely have read the riveting story about Rachel Barton Pine that was in last Sunday's Chicago Tribune. Rachel is a member of V.com who blogs regularly here. The story tells of her 13-year recovery -- physically, emotionally and professionally -- from a terrible train accident that destroyed her left leg. I thought Howard Reich did a fantastic job of reporting and putting together this piece, but both Robert and I were disturbed by what happened to it once it went online: both in how it was packaged and in the comments that were made. In fact, it prompted Robert to write a blog called It's time for the newspaper industry to die. Robert edits an online journalism review for the University of Southern California's Annenberg School for Communication. I invite you to read it and share your thoughts!